This news analysis was originally dispatched as part of Epoch Times China email newsletters. Subscribe to the newsletters by filling your email in the “China D-brief” box under this article, or sign up here. In the early 2000s, the arms manufacturer Lockheed Martin began designing near-space platforms to work alongside U.S. satellites. The program began amid concerns in the defense community that such platforms would eventually be necessary for the survival of the U.S. intelligence, surveillance, and reconnaissance systems that rely on satellites. Yet, like many other U.S. weapons systems that anticipate near-future threats, the project was cast to the wayside through budget cuts and a sense of hubris that the United States was far enough ahead of its adversaries to not worry. And now, like many other abandoned U.S. military projects, these near-space platforms are being developed by the Chinese regime. 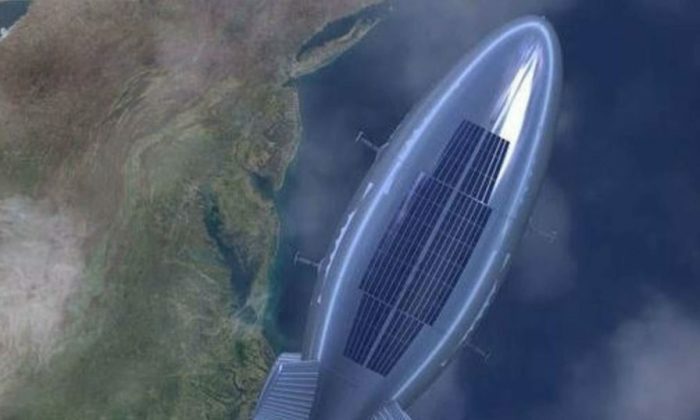 IHS Jane’s reported on Oct. 19 that the Chinese regime tested a high-altitude airship (HAA), the Yuanmeng (Dream). It’s a project of the Beijing Aerospace Technology Company and the Beijing University of Astronautics and Aeronautics. Richard Fisher, the author of the IHS Jane’s piece, and a senior fellow at the International Assessment Strategy Center, explained in a phone call why this development deserves attention. According to Fisher, even if the United States were to start developing the systems now, the Chinese regime could soon have working versions, while the U.S. would still just be in the concept stage. It follows a concerning pattern, he said, that could eventually lead to the United States falling behind militarily, while a totalitarian regime becomes the global military leader. Fisher noted that the Chinese near-space aircraft appear to be heavily built around concepts from Lockheed Martin, and that similar Chinese weapons projects also seem to pull from U.S. military designs. When the United States started Operation Desert Shield in 1990, it considered building “mobile offshore bases,” which were basically stationary military bases, complete with aircraft runways, designed to float on water. They would have allowed the U.S. military to have a base anywhere in the world within a month. The mobile offshore bases were never developed, yet an almost identical project was shown at the recent National Defense Science and Technology Achievements exhibition in Beijing. They call them “Very Large Floating Structures,” and could be the Chinese regime’s solution to its lack of land-bases needed to extend its military reach globally. In 1968, the U.S. scientist Peter Gleason wrote an article in the journal science proposing space-based solar power stations. The rationale was that solar panels placed in orbit would have almost constant sunlight. The solar panel project also never came to light, yet in 2010, the Chinese regime funded an almost identical program through the China Academy of Space Technology. Its state-run Xinhua news outlet reported in March that the panels could gather up to 10-times more energy by being in orbit. Then there was the U.S. Midgetman program, which called for intercontinental ballistic missiles small enough to be transported and launched from a vehicle. It was successfully developed in the 1980s, yet was abandoned in 1992. The idea behind Midgetman was that countries like the Chinese regime know where the United States keeps its nuclear weapons, and if a nuclear war were to take place, these locations would be its first targets. The mobile launchers were meant as a deterrent, so that U.S. adversaries wouldn’t know where the United States kept its nuclear weapons. The People’s Liberation Army Pictorial, a Chinese military magazine, published a photograph on Feb. 19 showing a system based on the same concept. The 16-wheel ballistic missile launch trucks are already in use. A list of similar cases could unfortunately go on for some time. Osama Bin Laden derailed these plans, however, with the terrorist attacks on September 11, 2001. As the war on terror began, the United States abandoned the development of many next-generation weapons systems, which defense experts said it would one day need to stay ahead of the game. Power struggles may be behind restructuring of the Chinese regime's military hackers.